This modern TV stand media console puts your TV at the center of attention while providing you with open component space and closed storage below. TV stand features a balanced design that perfectly complements any contemporary or transitional decor and space as well as lending itself to the new sleek, flat TV designs popular today although traditional tube and non-flat televisions can just as seamlessly be accommodated. At the center of this media TV stand media console lies the component area. This center area features a removable shelf and partial slit open back, making cable management easy! No more hassle getting your wires in and out and for proper heat ventilation for your cable box, DVD & Blu-ray player, home theater surround sound system, game consoles and any other equipment that you need to properly store and easily connect. The side closed storage areas to the left and right feature a wood door allowing for concealed yet accessible storage behind, perfect for your CD and DVD collection and anything else you need organized and in reach. 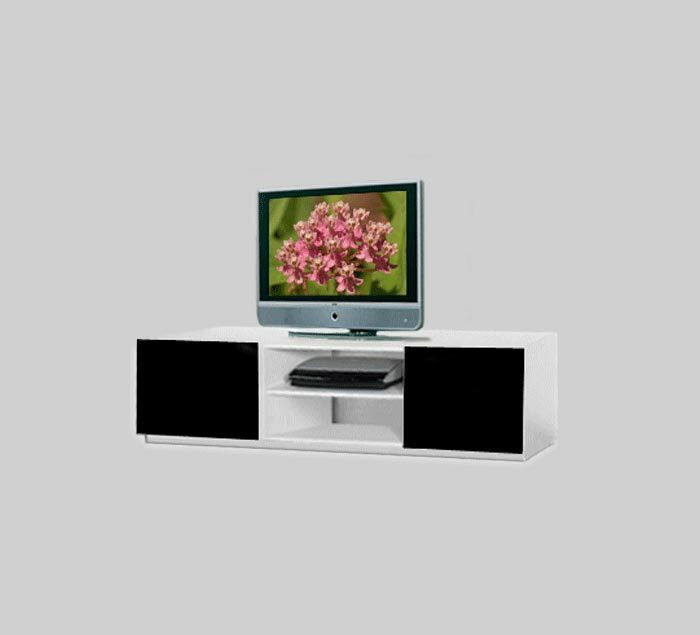 This TV stand is available with in-home delivery and installation. The total home installation includes unwrapping and appropriately placing the media console in the desired location, as instructed by the customer. Each furniture component arrives fully assembled making it secure yet just as easily can be picked-up and moved tomorrow. Packing materials will then be removed from the space and returned to us for recycling, leaving the only thing for you to do is to place your belongings and enjoy.